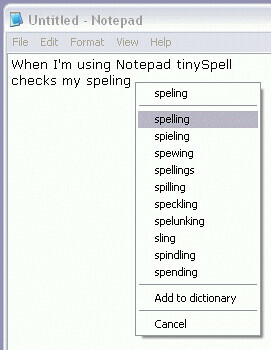 Ever wish you could check your spelling in Notepad, Internet Explorer, or any other text-heavy application? With tinySpell, you can. With over 110,000 words in its American English dictionary, tinySpell keeps track of what you're typing and alerts you when it detects a misspelled word so even in programs where there isn't a built-in spell checker you can make sure everything is correct. The tinySpell icon in your system tray turns yellow and gives out an audible beep when it detects misspellings. You can also check the spelling of any text you copy to the clipboard. Then hit the custom hotkey or click on the tinySpell icon to see suggested spelling replacements.